Baffled Coffee on Fawcett Road opened last year and I have no idea why I have not been before. I have been given many recommendations to try this Mediterranean styled café but I never go to Fawcett Road very much. It’s busy and isn’t as nice as some places, such as the seafront, South Parade Pier or Palmerston road. But, this week I pushed my silly thoughts aside and tried Baffled Coffee. Near the school, it’s a very small shop with rustic wooden benches and tables and orange and grey décor. As I approached, a chalkboard outside boasted ‘£6.50 meal deal.’ Inside there was a lot of energy with several coffee drinkers chatting or on laptops. 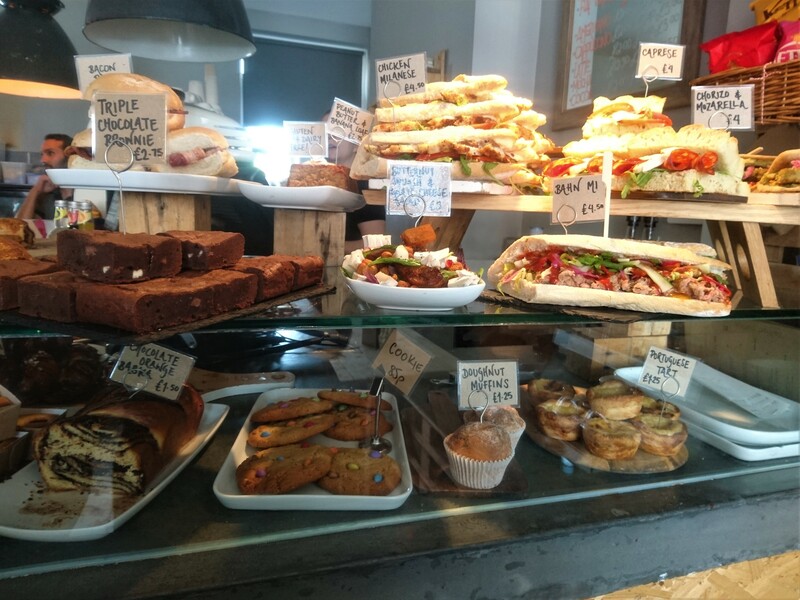 Staff flurried behind the till which was piled with tempting cakes, sandwiches and salads. On the walls were signs saying who their suppliers were including locals Arun Meats and Northney Farm Dairies. I entered and was immediately drawn to the till where the food was. There were large baguettes that were packed with meat and salad and cakes including a homemade Donut Muffin, Cinnamon Swirl and Portuguese Tart. I sucked in my drool and picked up a menu from one of the tables. They do various other treats, apart from rolls and sandwiches, including a curry, mac and cheese and meatballs. These meals come in two sizes which is a nice option in case you aren’t so hungry or, are particularly ravenous. The prices were very reasonable too with many options costing you on average £4.50/£5 and larger options costing £9. They were all filled with generous ingredients and had a unique flare to each dish, cultivating the best flavours from around the world. Ordering a Chicken Milanese, home baked baguette with rosemary breadcrumbed chicken, tomato, lettuce and mayonnaise, and a tea; I was told that I could get the meal deal. This was £6.50 and included my medium tea, sandwich AND a cake. I had a few choices for dessert and settled on the Donut Muffin. I quickly paid and thanked the server for her help before sitting on a small table on the left-hand side of the shop. I was already quite impressed at this point and as I waited for my food and drink, I took in more of the surrounding details. They had a huge fridge filled with soft drinks and smoothies, at a reasonable price, and plenty of vegetarian options on the menu. A few more people arrived and behind the till a man was mixing a huge salad in a bowl with leaves, rice and veg. It looked amazing and so did my food that was placed before me. The three items hardly fitted on the table but we managed, just. Good thing I didn’t have someone to join me, then there definitely wouldn’t be any room. The bread was warm and crispy, wasn’t too hard and had a nice flavour. The chicken was tender and the rosemary breadcrumbs gave it a tasty edge. The mayo was a good addition as otherwise, it would have been too dry. It did make quite a mess though. Five minutes later, the sandwich was devoured and I was covered in mayo, frantically grabbing at napkins. That would have been plenty for me but I also had the muffin. Finding some room, I took an adventurous bite. And then I spat it out. The muffin, covered in sugar and looking like a dinky donut, did not taste as one would expect. A ‘donut’ muffin, in my opinion, should be a simple sponge with sugar but instead, the sugar was cinnamon and cinnamon is one thing I cannot stand. What donuts have cinnamon in them? I suppose you could include Spanish donuts but then the muffin should be more appropriately called: ‘churro muffin’. Other than that I thoroughly enjoyed my trip to Baffled Coffee and it has changed my perceptions of Fawcett road. A place I would never go to is now a place I will go to a lot, all because of this small, quaint café. There isn’t much else to entertain you, unless you want some cheap furniture or marijuana seeds, but the affordable and high-quality food of Baffled is more than enough reason to visit. It is unique and flavoursome and I can’t recommend it enough, especially their meal deal. It’s another worthwhile and must-see addition to my Southsea Food Tour. Thanks for the recommendation! It looks pretty good there, I’ll have to stop by next time I’m down that way. 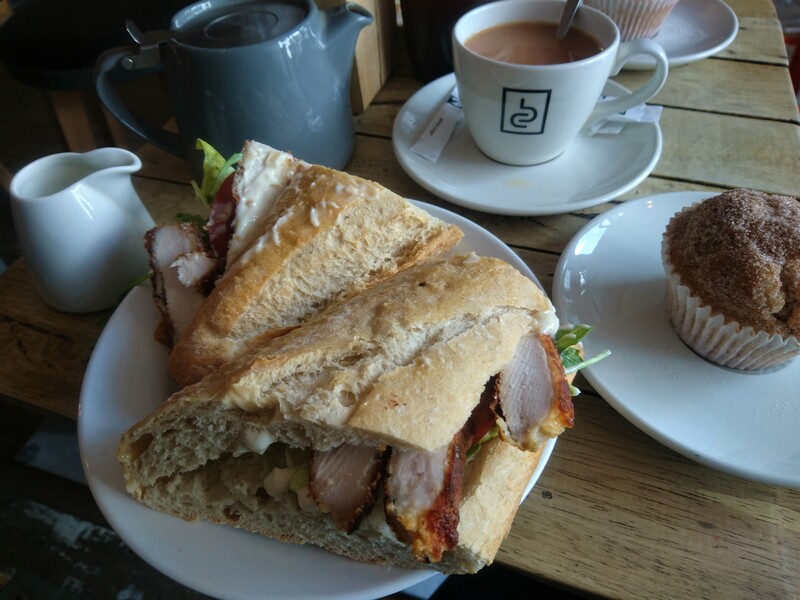 It reminds me of a deli café in Alresford called Caracoli which has gorgeous food like this. (Also, I have that grey tea pot and it is actually the cutest).